When the user hits the Create button OnWizardCreate function will be called. DisplayWizard will only show one wizard for every wizard class. 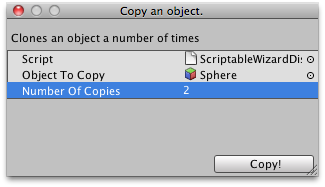 Simple Wizard window that copies a GameObject several times. // Simple Wizard that clones an object.